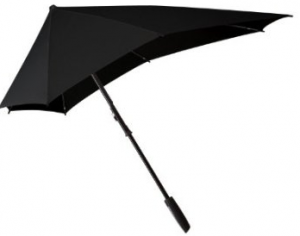 As talked about previously, the senz smart umbrella is the newest design in the wind resistant umbrella range. The senz smart has won three prizes for its new wind resistant umbrella. It’s priced at £29.99 which is considered mid range for a quality umbrella. Like most of the wind resistant umbrella range today, the senz smart is made from fiberglass but also contains aluminum and steel. The blend of these light weight metals allows it to be able to resist winds of over 50mph. For a wind resistant umbrella the senz comes in very light, weighing under 500g, due to the the metals used. A lot of thought has gone into the design of the handle for the senz smart, the handle is big enough for you to get your hands around and soft enough to get a nice and comfortable grip. The canopy is made from polyester which is another common theme with all other wind resistant umbrella, along with extra reinforced rib construction, ensuring you that it won’t turn inside out. For me personally the biggest factor of the senz smart wind resident umbrella is the original yet functional design. It breaks away from the usual style of wind resistant umbrellas, while at the same time improving the quality and functionally of the umbrella. This is more than just an umbrella to keep you out of the rain, it’s a future fashion symbol. I actually got this umbrella as a Christmas present and it has been the best thing I have gotten since I was 15 and was given a Xbox. From walking to the bus stop or from the office to the car this senz smart wind resistant umbrella ticks everything an umbrella needs to do, with the kicker of looking sleek and stylish.I would recommend the senz smart for the everyday man and women.